Thread: Anyone with an eight yard Tweed kilt, for feedback? I have a double wide length of Harris Tweed, that has been awaiting time for me to make a kilt out of it, now that I'm retired I have the time, finally. However, most past posts seem to agree that five yards of tweed was enough..but I see some Scottish kilt shops selling eight yard tweed kilts. I would appreciate any feed back from members that do have an eight yard "tank", made of tweed. Too much?, or very pleased? I live on the wet-coast (west coast/ Fraser Valley) of British Columbia, which has a similar climate ( from what I saw) to the wet-coast of Scotland. We gauge kilt fabrics by the 'hand' and the weight. The weight is of one linear yard 60 inches wide. Or 2160 square inches. 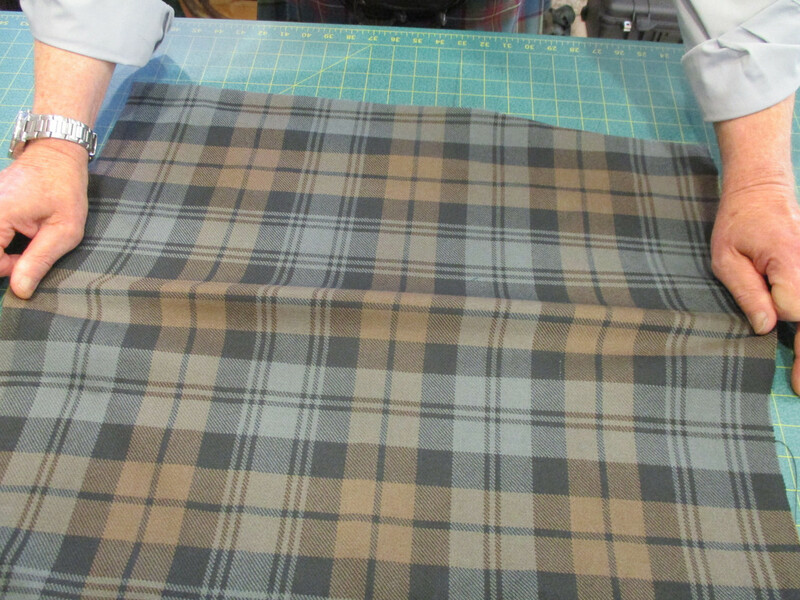 The usual 16oz kilt fabric weighs 16oz or 1lb per linear yard. Can you weigh the fabric you have? Hand is a little harder to describe. Every one feels hand a bit differently. Kilt fabric will usually be a Twill weave of tightly spun worsted wool. Some Tweeds are herringbone weave and have fibers sticking out sideways. This is called 'nap'. Kilt fabrics are also, usually, quite supple and elastic. Some Tweeds are almost industrial strength. This is why they are often used for overcoats and robust outerwear. The reason you may see Tweed kilts listed as 5 yards is due to the weight of the fabric and how supple it is. It is 16 0z. Twill Harris tweed. The "hand", to me, is much softer and the weave looser, than the kilting fabric I'm use to ( mostly Fraser and Kirkbright tartans). I'll see if I can get a reasonably focused close-up photo, to post. Last edited by jhockin; 3rd October 18 at 08:25 PM. jhockin, because it has a plaid pattern to it, I am assuming that you will be pleating it to some sort of pattern (i.e. - stripe or sett). The think with tweed kilts is often there is no pattern and so it is just a matter of measuring the width & depth of pleats. The plaid will dictate how much material is inside the pleats, and therefore will he laid out similarly to a regular, tartan kilt. Are you planning to pleat to the sett, or perhaps the yellow stripe? Undecided so far, but likely to stripe. Last edited by jhockin; 4th October 18 at 10:15 AM. Yes, it's a twill weave. You can tell by the way they form diagonal lines of colour. Looks like a 2x2 twill to me. Last edited by Tobus; 4th October 18 at 11:11 AM. Have you made any progress on the Tweed kilt? I am considering a similar project myself and it would be great to see pictures of a tweed kilt especially one with a plaid.